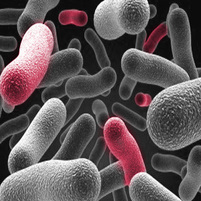 An upper division course that investigates microbial metabolic diversity, bacterial genetics, host-pathogen interactions, microbial ecology, and virology. Includes discussions of the primary literature and the course is accompanied by an inquiry-driven laboratory. Offered fall 2012, fall 2013, spring 2015, spring 2017, spring 2018, spring 2019. A seminar course that examines literature on interactions between bacteria and their hosts, focusing on the molecular mechanisms that underlie symbioses and pathogenesis (and everything in between). Offered for the first time in the spring of 2014. A biology course designed for non-science majors. Focuses on the biology underlying infectious diseases, including cholera, HIV/AIDS, and tuberculosis, as well as efforts to halt these diseases. Includes discussion of emerging infectious diseases as well, and consideration of societal factors that contribute to the spread of infectious disease. Offered spring 2013, 2014, fall 2017. The introductory course in cell and molecular biology taken by prospective biology and science majors and pre-health students, co-taught with Caroline Goutte, Patrick Williamson, and Julie Emerson. Participated in 2014, 2016, 2017, 2018. ​A course-based undergraduate research module in Biol-271 Microbiology 2018! Students will discover new regulators of an important metabolic gene in the bacterial symbiont Vibrio fischeri using transposon mutagenesis and sequencing in this new lab module planned for introduction into Biol-271 in 2018! Genetic tools have been generously provided by Mark Mandel of the University of Wisconsin-Madison.